The investigation into possible Russian collusion with Donald Trump’s presidential campaign continues. And today, January 3rd, that controversy was reignited when The Guardian reported that Bannon called Donald Trump Jr.’s meeting with Russian officials “treasonous” and “unpatriotic” in a new book. The book, Michael Wolff’s Fire and Fury: Inside the Trump White House, is based on more than 200 interviews with the president and those in his administration. 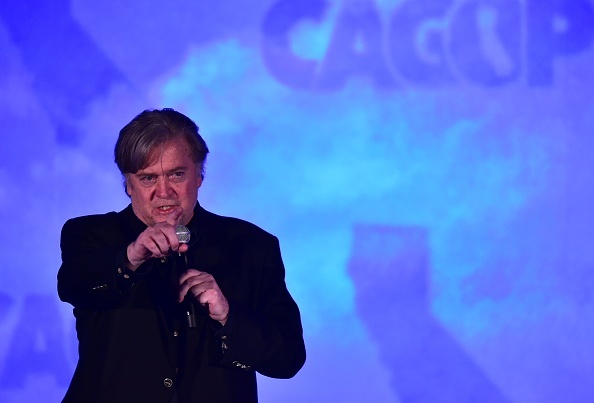 Bannon was a key source for the book, reportedly providing scathing criticisms of the Trump administration. At the heart of the Russian investigation — and Bannon’s comments — is a meeting that occurred between Trump Jr. and a Russian attorney at Trump Tower on June 9th, 2016. The lawyer, Natalia Veselnitskaya, had promised that she could provide Trump Jr. with incriminating information about Hillary Clinton. Trump Jr. has denied that the presidential campaign was discussed during the meeting. Bannon referenced this meeting in Wolff’s book, saying he felt Trump Jr. was in the wrong. "Even if you thought that this was not treasonous, or unpatriotic, or bad sh-t, and I happen to think it's all of that, you should have called the FBI immediately," Bannon reportedly told Wolff. Trump Jr. responded to the reported quotes by tweeting that Bannon was lying. President Donald Trump also responded to Bannon’s accusations, denouncing Bannon entirely. "Steve Bannon has nothing to do with me or my presidency," Trump said in a statement released by the White House. "When he was fired, he not only lost his job, he lost his mind." Bannon’s statements against Trump Jr. could be accurate, but they could also be motivated by spite. But between Bannon’s quotes and the recent revelation that Trump Jr. was exchanging messages with WikiLeaks (which has been linked to Russian involvement in the election), the Trump Tower meeting is looking more and more suspicious. We’ll be on the lookout for more developments in the Russia investigation.